I was in my second year of teaching. We had just moved to Alabama a few months before. I just wanted to be close to home after my brother was killed. I was teaching at a small Christian school. That day started like every other day of teaching. I remember being called to the office saying something about my husband coming out to talk to me about something. I knew something bad had happened. When he arrived, my mom and Fred were not too far behind. They had all come to tell me that my dad had passed away. I guess someone else drove my car home. I don't really remember. He had lived with JP and I for a while after my brother died, until he hit a depressive episode and wouldn't go for help. So, in the middle of the night we drove from Nashville to the VA in Tuscaloosa. Dropped him off and that was the last time I saw him. I didn't try to see him in those few months after we moved back to Alabama, it was just too hard. I was just too tired and still trying to process my own grief. I regret that. 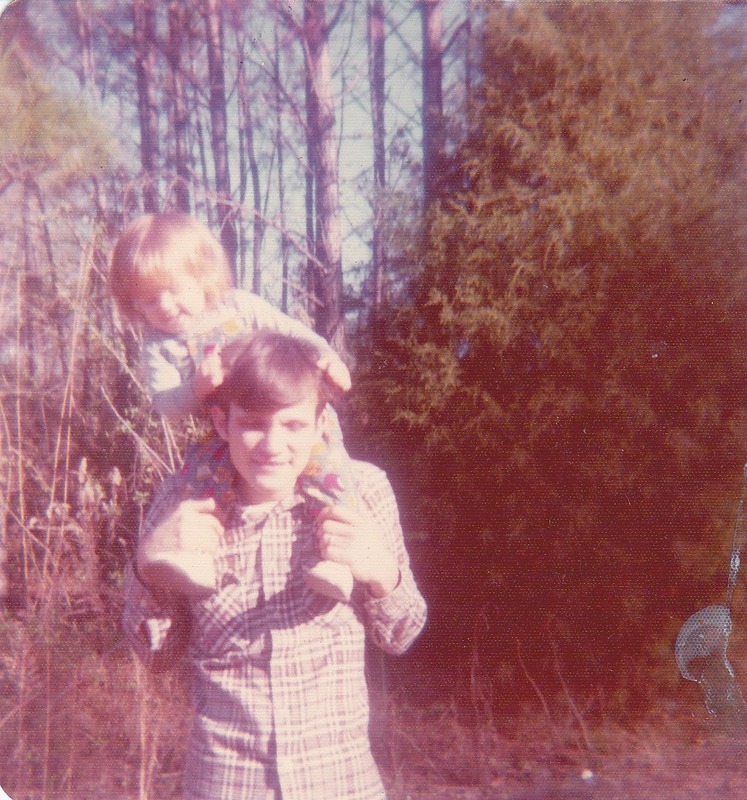 I grieve his loss today, not just because I miss my dad, but because I miss all the things that could have been. The things that his addiction stole from me. The things that his addiction stole from him. I miss all the opportunities that we could have had together. So, I mourn him, but also everything I wished we could have had together, but just couldn't be in this life. Grief has a way of sneaking in through the back door sometimes. Especially on the anniversaries. Tera made Daniel a chess cake for his birthday! We weren't sure she was going to be able to pull it off, but it came together quite nicely! Oh my, where have the years gone? Happy Birthday to my fun-lovin', crazy, make-me-laugh-my-head-off son! I love your passion, your drive and your focus on the things you love! But I love you even more! I'm so proud of the man you are growing into. Last week was crazy. I spent the entire weekend recuperating. JP had to work on Saturday, so Sunday we did nothing. I was on the verge of sickness and actually took a nap Sunday afternoon. I've been staying up way too late and the stress of the changes with JP's shift have been taking their toll. I am fighting hoarseness today after raking some grass yesterday that hopefully won't turn into anything else. Sometimes, I can get so overwhelmed with so many things that I forget to do things for me. I make sure the kids get the schoolwork done, that they show up for lessons and activities, that they are clean and fed and their spiritual lives are encouraged. So much so that I'm too tired to think for doing things that are just for me. Oh, the kids will suffer. I'll be keeping them out too late. We just can't add anything else to the schedule. Maybe in the future, when they are bit older. You know...copping out type excuses. I'm a part of one cool family! I've got the most supportive husband in the world! My cheering section is pretty darn awesome! Doing something for me IS doing something for them! I've put off doing swim lessons for years. Everything just fell into place this year. It's been so awesome! My kids never complain that I have to go to swim lessons. They are cheering me from the sidelines with the biggest smiles you've ever seen! My husband pushes me out the door and is so proud. Now, I have the opportunity to sing in a community choir at the local college. I almost talked myself out of doing it this semester. It's so late, JP's shift is still crazy, it will take too much out of the kids... What I really am doing is copping out, because it's been a while. I'm nervous and wondering if I can still do it. What if I mess up? Then, I saw on the facebook page..."Bring your Messiah score if you have one!" That settled it for me, I'm doing it!!! You know what my family said (Even the one who's going to have to sit through the rehearsals with me after her choir)? "Go for it, Mom! You'll be awesome! You should do it! I'll take personal time at work..." How about that for a cheering section? I get tears in my eyes just thinking about how blessed I am to have these people. Moms, don't use your kids as an excuse for not doing the things you enjoy. Those things that make you a better person for them. Don't neglect your devotion time, your hobbies, taking care of yourself. Taking care of yourself is showing them how to take care of themselves. Don't wait until they are all grown up to start! Doing something for you IS doing something for them! Monday feels like it was two weeks ago! Have you ever had one of those weeks where every meeting, sign up, lesson, tournament, etc. just seemed to fall on that week? It's been one of those weeks for us! On Monday, Tera and Daniel did some canning entries for the fair. JP took Tera's peach jam to a co-worker and she let a friend try it. Tera actually made a sale! Flute lesson and CCI meeting had us on the go Tuesday during the day. Both Michael and I had a swim lesson on Tuesday evening! I have to say, I'm not an expert by any means, but I'm doing things in the water I thought I would NEVER do. It feels awesome to finally be doing this! Wednesday, we had a wonderful time with our writing workshop friends. Then, we went to sign Tera up for a community middle school choir. Michael was so happy to play in the fountains. I knew I had a change of clothes in the car, so I just let the boy go for it! After I got Michael in clean, dry clothes at the car, we went out to dinner with our friends to Chic-fil-a before attending a Celtic band concert at the library. It was a packed house! Today, I left the kids working on schoolwork while I went grocery shopping. (The only perk of JP's work schedule right now.) This afternoon, Tera and I got haircuts. It's been a long week! We had so much fun with great friends, but we are tired! I have absolutely no plans for this weekend. I do not even want to think about leaving my house until next Tuesday. Some weeks are just crazy busy! You get through them and they make you so much more thankful for the relaxed weeks. I'm looking forward to one of those kind of weeks...next week. I have felt on-the-go this week--2 swim lessons, flute lesson, chess for the afternoon, shopping mixed in between, mowing this morning. I need an early bedtime for sure! I feel like I'm coming out of my "funk" just a bit. Today, the kids (Tera and Daniel) and I sat down for a meeting. I outlined some of my expectations for them and we talked about priorities/upcoming deadlines. They are obsessed with chess right now. I just want to make sure that we deal with time management and I guide them through balancing their interests with responsibilities. Expectations: Taking ownership of your schoolwork; daily instrument practice; come to Mom or Dad for help with your schoolwork (do not skip things you don't understand); show your work; weekly work with Michael; rooms clean before videos. Deadlines: Meals on Wheels crafts, fair projects (art, canning, photography, etc.) and Sept. Chess tournament. Doing this with them, felt like we were all on the same page. It helped me feel more organized and like all my ducks were in a row. My weekly planning is getting back on track. Flying by the seat of your pants is not a good feeling for anyone. Revolutionary War studies are going really well for Tera! A cool photo Daniel took this week using my camera. Kindergarten has been relaxed as of late, but this boy is constantly learning. It's almost scary! He's been reading to himself chapter books at night and building like crazy. Yet, I still worry! I'm glad I have friends who snap me out of it! We got our yearbooks this week! (Yes, our homeschool group does yearbooks!) They are so awesome! Is there some skill you've always felt you could never master? Just get out there and try! Some of our long time friends were in town this weekend! It was so wonderful to see them! "That first day on the river, I didn't understand what I was getting into, how God was about to rearrange my priorities, break my heart, push against the thin lining of my faith, whet my tongue for a joy I'd never tasted, and open my eyes to the poor. I knew I was on the brink of an adventure of a lifetime, but I had no idea just how far the river would take me." 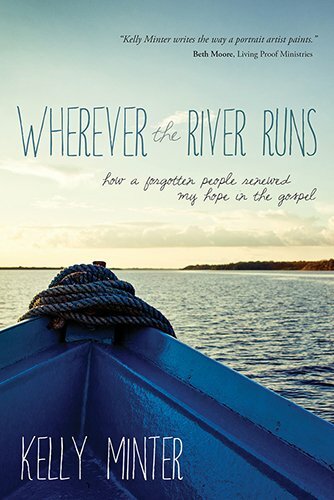 "In Wherever the River Runs, Kelly Minter invites us on a journey down a river teeming with piranhas and caimans, as well as machete-wielding mothers, heroic jungle pastors, faith-filled children, and miracles too seldom experienced in our part of the world. Kelly's honest and engaging narrative pulls back the curtain on one of the most captivating places on earth as well as on parts of the gospel we may be able to recite but have never fully believed. On this beautiful adventure through the jungles of Brazil and the tangles of the soul, Kelly rediscovers Jesus among a forgotten people living well beyond the corners of her previously defined faith---a people who draw her back to their country, their pain and their hope in Him, again and again. Minter uses humor to get across important key points. I found myself laughing out loud at her descriptions and observations on life. The author's lessons in the Amazon flowed over into her everyday life. She takes us through the journey of recognizing the needy that surround us and how we can open ourselves to be "inconveniently needed." Minter's approach to the poor. She reminds us of it's importance in our world, not just on a mission trip! "If we distance ourselves from the poor, we may be able to maintain a more comfortable and certainly tidier existence and theology, but we will miss having a deeper, more abiding, and more fulfilling relationship with Jesus." Kelly talks a lot about her "faults" and never pretends she has it all figured out. She is just one of us trying to find her way and draw closer to Jesus in the process. Easy to read style that draws the reader into a two-fold story that begins in the Amazon and continues to unfold throughout every other area of her life. "These moments were coming for all of us, the ones you can't orchestrate or plan for. When you're obedient to look after the least of these-the vulnerable, the orphan, the widow- the Holy Spirit comes with the territory." To find out more about Kelly, visit her website. Kelly Minter's book, Wherever the River Runs. I feel it coming...that old feeling. It's that time of year again. It hits me between the eyes. I feel down, out of sorts for no reason whatsoever. There's a temporary change in our family's routine. I'm thrown for a loop. The season threatens to overtake me. But do I respond in all the right ways? At least I can take a step back and recognize it. For now, I'm moving my bedtime back to a decent hour. Trying to eat better and exercise more. Trying to make more time for reading my Bible and prayer. Watching less TV on hulu. It's not as bad as it sometimes feels, I remind myself. I'm getting out of bed every morning, interacting with my children, doing school, making sure everyone is fed and clean. We're pushing through and by some standards, we are thriving.